In the early 1960's the Colgate Palmolive Company came up with the idea to put children's bubble bath in plastic bottles shaped like favorite cartoon characters. They made quite a bit of them & I have collected them for years. I'm not sure why I started to collect them but I bet it's because I loved them as a child. At my grandmother's house she still has the Mr. Magoo one that I used to play with. They have done many characters including, Felix The Cat, Superman, Tweety Bird, Mickey Mouse, & even the Beatles. I have about 65 of them that I will share later but right now I wanted to focus on these four, The Universial Monsters. This complete set of 4 bottles are quite RARE. They made Frankenstein, Wolfman, Mummy, & The Creature From The Lost Lagoon! The Creature Soaky, in this picture above, is shown with it's original "packaging", a RARE cardboard sleeve that it fit into. This photo originally comes from "The Gallery of Monster Toys". 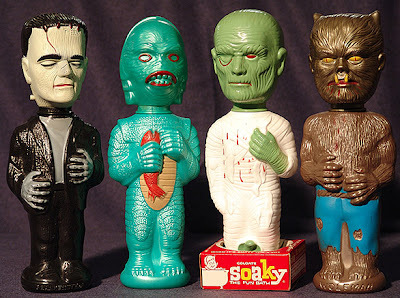 Visit the site-- it has tons of great photos and info on vintage monster toys, and is run by my friend Raymond Castile. Hope you don't mind but I linked to your post and 'borrowed' the photo. Great blog by the way! Don't mind a bit-- and thanks for the compliment! I like your blog as well. I can't find the link to my blog that you mentioned, but I'm glad you found my blog.